This afternoon, I spotted the following sitting in a driving rain on a street corner half a block away from our house. Maybe some people still have not realised, that oil is going to be short very soon. The author of this sign, just wanted to give attention to this issue. If I come along this sign, I will honk. Would it be ironic to honk if you’re driving a hybrid? Would it be ironic to honk if you”re driving a hybrid? No, I believe the sign intends for hydrid owners to honk. But us regular gas-guzzlin’ folks could also conserve gas — simply by carpooling or by abstaining from taking long and/or useless trips. I don’t think there’s any irony in the sign — driving a car with an internal combustion engine down a street doesn’t necessarily restrict you from conserving fuel. Jack: I think that the sign embodies irony. Heh. Unless of course it meant flatulence. Honking uses electricity. The alternator converts gas into electrical energy. Admittedly a very small amount. 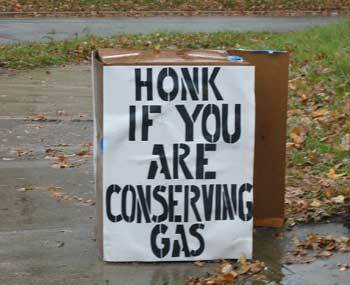 But what if we had a “conserve gas day”, and at a given time, say midday, everyone around the world who was conserving gas honked. I wonder how much gas that would use. My quick calculations, alright a stab in the dark, have shown the amount would be a fair bit of gas. I think I just kicked our coal-fired power stations into overdrive writing this crud. So did you honk or what? Didn’t you ever hear about “oil peak” aka “Hubbert peak” ? Man I can just imagine the happy driver honking and getting it about half a mile down the road and feeling like a complete idiot…the kind of thing I would fall for.